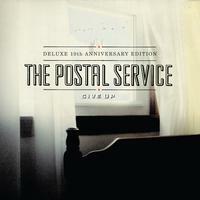 This 10th-anniversary edition of the only Postal Service album includes every note from that serendipitous time. The original 10-song album is remastered for improved fidelity, but the 15 bonus cuts—with b-sides, remixes, and outtakes—make this an essential commemorative edition for the million-plus fans who turned Give Up into the second best-selling album in the Sub Pop Records catalog (just behind Nirvana's debut, Bleach). Not bad for what was a side project for Death Cab for Cutie's Ben Gibbard and Figurine's Jimmy Tamborello. The duo added Rilo Kiley's Jenny Lewis and Tattle Tale's Jen Wood for cameos, and this modest electronic pop album connected with indie music fans who were mostly accustomed to guitars, not synths. Of the bonus material, the covers of Phil Collins' "Against All Odds" and John Lennon's "Grow Old with Me" best illustrate The Postal Service's talents. Gibbard brings all the heart with his melodic and guileless vocals, while Tamborello sketches out sparse, arty arrangements on the keyboards and computer.